Pins - Limited Time Sale! 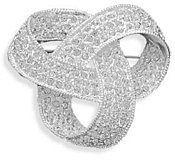 Silver plated base metal and clear swarovski crystal 46mm love knot fashion pin. This item contains nickel free and lead free base metal.